Money Island Marina is a membership based community. This page is designed to provide more information about the new membership program at Money Island Marina. If you have an unanswered question, please send it to tony@moneyislandmarina.com. What are the benefits to me? Why should I join? There are many benefits and reasons to join as a marina member: 1) makes boating and fishing more affordable, 2) be treated as a VIP here with member privileges, 3) ability to reserve bait and seafood in advance by phone or text message, 4) ability to picnic areas use for group use, 5) avoid small cash purchase transactions, 6) charge privileges at the marina, 7) feel more comfortable from increased security knowing everyone here is a member or guest, 8) invitations to seafood barbecues, lectures on local issues and special events. Again, there are many more. Take a look at the membership benefits list and you will likely see more reasons. Why are we changing to a membership-based system? The membership plan allows us to convert from a public to a private-use facility. The advantages to us are: 1) better information about those who are on the site, 2) improved security, 3) more predictable revenue, 4) ability to offer more value and increase the number of services, 5) ability to bypass handling so many small dollar transactions, 6) reduce waste of live and fresh baits, 7) increase overall usage of the facility, 8) reduce trash and damage because users feel connected to the facility, 9) create a positive community environment, 10) allow all of us at MIM to more easily know all of our users by name, 11) encourage referrals to new members, 12) avoid health department concerns and clarify that we are not a retail food establishment as defined by NJ law, 13) benefit from the positive public relations be offering something different and unique, 14) allows the marina manager to identify and welcome guests as membership prospects, 15) eases our sales tax compliance burden. We could go on, but you get the idea! Why are some things free to members and others are not? The concept is to replace the fee for products and services that do not cost us on a per unit basis with a single annual household membership fee. For example, to illustrate the distinction, minnows or grass shrimp that we catch are included as member benefits (even though we must pay a license fee to the state to catch them). In contrast, bait or tackle that we must purchase is not included as a member benefit. Who is covered under the member policy? Membership privileges extend to the listed member(s). Visitors not accompanied by a member are not covered by the membership policy but are considered guests. What if my wife or children, brother, sister, parent of friends are not members? Visitors who are not members are your guests. Guests are welcome and encouraged. Members may bring as many guests as they wish. However, please check in on arrival and ask guests to fill in a Guest Registration Form. Guests are people who arrive and leave with a member, usually in the same vehicle and are the responsibility of the member while using the facilities. Guests are expected to check in fill out a Guest Registration Form. In some unique cases when a guest is using some specific marina resources there may be a guest fee. Normally we anticipate that that there is no guest fee. The marina manager has full discretion on managing guest policies. The cost is $60 for the 12 month membership if paid in cash or online debit card. The membership runs on an annual (12 month) basis regardless of when you join. At the next membership renewal date, the membership is changed to a calendar year basis and is reduced on pro-rated basis based on when you joined. Join on January 1, first year membership is $60, then renewal is $60. Join on July 1, first year membership is $60, then renewal is $30. A $2 credit card processing fee may also be applied if paid by card on site. The membership fee may change in the future. What happens to my membership fee payment? The membership fee is used to pay for and offset basic marina operating services (electric, phone, internet, security, fees, supplies, etc.). Property management services are provided by Baysave Association that handles all marina finances. In most cases we maintain an open books policy so if you have a question about marina finances, please ask. We have an online membership application form but you can also join in person/on site or even with a message that contains your contact information. Payment is not required with the online application; we will send an electronic invoice. The marina manager will contact you to make an introduction, verify your contact and emergency information. We will occasionally communicate by text message and email with marina communications, news and marina offers. We have a goal of 200 members in 2018. Check-in – Members are asked to ‘check in’ when they arrive at the marina. That check in can be simply a wave as you drive by to the dock, a cell phone call or text message as you arrive or, of course, a short chat in the bait shop. The important point i to be in communication with marina management. Referrals and feedback – We expect that if you are pleased with your marina experience that you tell other member prospects. We expect that if you are not pleased with any marina experience that you tell us. We expect you to communicate with us in person, by phone or text message. Cancellations – If you need to cancel a reservation, please do it as early as possible. Keep contact information up-to-date – Please make sure we have current contact information for the member and emergency contact. Resources are offered on a first come first served reservation system. Reservations can be made in person, by phone or test message. The marina manager will confirm reservations. What happens if I make a reservation and don’t show up? We understand that plans change. Changing weather conditions often disrupt our plans here on the water. However, we expect member who make reservations will actually show up or cancel those reservations within a reasonable time frame. Resources that are reserved are not available to other members and have a real cost to our operations. Loss of use of our resources for “no show” are not covered by the membership agreement and you may be charged extra for this loss of use. Members who make a reservation and don’t show up lose their reservation privileges until they speak with the marina manager, “settle up” and have that privilege restored. Is this an unlimited free bait and ice deal? For 2018: First, we must allocate the daily quantity of available bait and ice with estimated expected demand. (This is one of the reasons that calling ahead for reservations is important). In some cases rationing may be necessary. Second, the offer is meant to provide reasonable use while using our facility. The membership agreement is not intended, for example, to provide ice for your party at home or to stock up on bait for your next fishing trip out of Cape May. Unlimited ramp use is included with the membership fee. 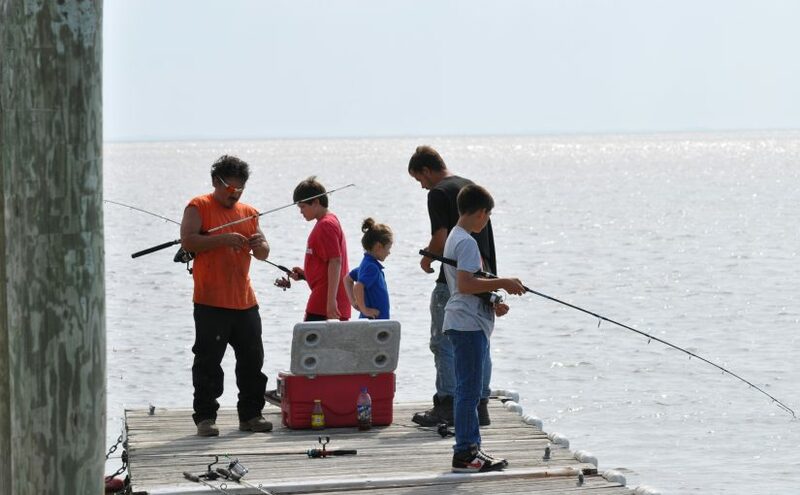 For 2019: Ramp, bait and ice are not included in membership fees, however a low cost seasonal ramp fee will be offered for $40. A complete membership application package is available for download that includes the current marina policies. I have an idea or a question. Who should I speak with? We want to hear. Please contact any staff member. What if there is a disagreement about membership or benefits? The marina manager has full authority and discretion on site for all issues at all times. If you have a dispute, complaint or feedback, please contact the controller (Tony).